Do you wish to restore the good look of your windows fast and without effort?Are you seeking for methods of effective window washing? If the answer is positive, you have come to the right spot! With the experts of window cleaning in North Kensington, you will positively bring back the sun rays into your property. You will enjoy crystal clear glass surfaces as well as completely clean frames and ledges. You will be able to use your freshly-acquired spare time as you wish while we clean the windows of your home. You will not only stay away from this tedious and demanding work – our services will also give you some alluring advantages. We also provide our professional services in nearby areas: South Kensington, Battersea, Kensington, Chelsea, Belgravia. You can depend on the team - they are one of a kind specialists of window cleaning. They all have passed through complex training sessions, so you can receive second-to-none help for all window kinds. What we can polish includes: small, double, garden windows, bay or sash windows, patio doors, French doors, conservatories and roof windows. Your property can become better instantly with our assistance. Contact us any time you need great window cleaning for your home or workplace. Improve the look of your office – the specialists of commercial window cleaning will deal with that. As part of our specific technique, we use water-fed extension poles. With this technique, we can clean entirely the windows from outside of your workplace, as high as the fourth floor. In order to reach highly-rised windows we use rope access. We guarantee your glass panes will look great, regardless how high is the building. With the help of the team of experts London's skyline will never be filthy. We use exceptional methods of window cleaning to make sure you will have superb end results. With the water fed pole system, high pressure cleaning and rope access team, you can rest assured that your property's glass surfaces will be sparkling. Furthermore, your property is in good hands – the cleaners are fully insured and thoroughly trained. Our water fed poles are linked to water supply vans, while our rope access guarantees safety – even when we clean high-rise buildings. You can get advantage from these methods now – dial 020 3746 3113! 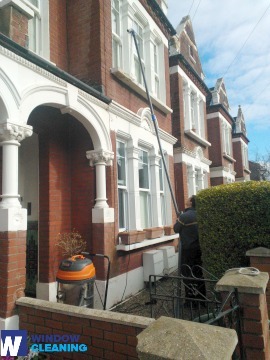 Request our window cleaning in North Kensington for your residence. We will use mentioner earlier methods – water fed extension pole system for lower windows and rope access tools for taller buildings. For the entire service we use purified water. Request a service today – ring 020 3746 3113 and talk with our call centre staff. You also have to option to fill in our online booking form or use our chat option. The nearest tube station serving W10 North Kensington is Sloane Square.